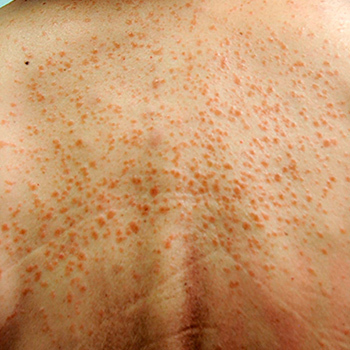 Cutaneous metastasis from a carcinoma is a relatively uncommon phenomenon. Prompt diagnosis is crucial, as it will have future implications, particularly regarding prognosis and treatment. Skin metastases can be suspected and recognized earlier through physical examination than metastases in other organs or systems. However, they can be a diagnostic challenge due to the variable clinical presentation. This case highlights the importance of having a high index of suspicion for cutaneous metastases, especially in patients with a previous history of cancer. Hu SC, Chen GS, Lu YW, Wu CS, Lan CC. Cutaneous metastases from different internal malignancies: a clinical and prognostic appraisal. J Eur Acad Dermatol Venereol 2008;22:735–740. Schwartz RA. Cutaneous metastatic disease. J Am Acad Dermatol 1995;33:161–182. Lookingbill DP, Spangler N, Helm KF. Cutaneous metastases in patients with metastatic carcinoma: a retrospective study of 4020 patients. J Am Acad Dermatol 1993;29:228–236. Chopra R, Chhabra S, Samra SG, Thami GP, Punia RP, Mohan H. Cutaneous metastases of internal malignancies: a clinicopathologic study. Indian J Dermatol Venereol Leprol 2010;76:125–131. Gan EY, Chio MT, Tan WP. A retrospective review of cutaneous metastases at the National Skin Centre Singapore. Australas J Dermatol 2015;56:1–6. Saeed S, Keehn CA, Morgan MB. Cutaneous metastasis: a clinical, pathological, and immunohistochemical appraisal.J Cutan Pathol 2004;31:419–430. Sariya D, Ruth K, Adams-McDonnell R, Cusack C, Xu X, Elenitsas R, et al. Clinicopathologic correlation of cutaneous metastases: experience from a cancer center. Arch Dermatol 2007;143:613–620. Krathen RA, Orengo IF, Rosen T. Cutaneous metastasis: a meta-analysis of data. South Med J 2003;96:164–167. El Khoury J, Khalifeh I, Kibbi AG, Abbas O. Cutaneous metastasis: clinicopathological study of 72 patients from a tertiary care center in Lebanon. Int J Dermatol 2014;53:147–158.